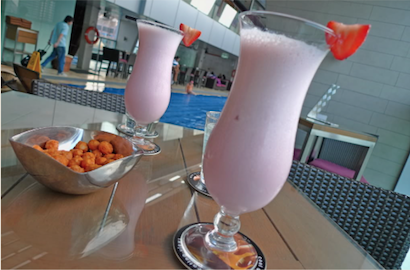 In Part 1, I blogged about Luna Bar. Now it's SkyBar's turn. 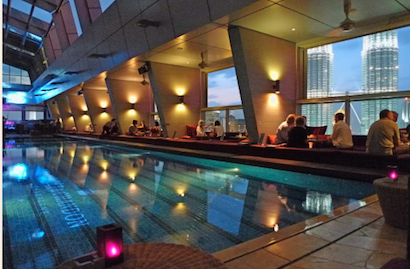 Located on the 33rd floor of Traders Hotel (next to KL Convention Centre), SkyBar was every bit as impressive as Luna Bar, if not more. I was there quite early at about 6pm and there were still a few people swimming in the pool. 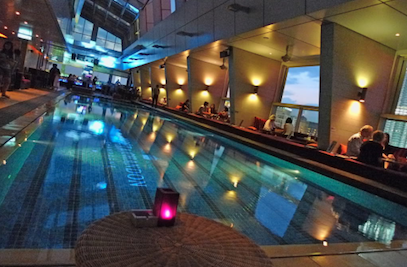 Yes, just like Luna Bar, there's also a swimming pool in SkyBar. However, no one swims there in the later part of the evening or rather, no one is allowed to swim during that time. Can you see the Twin Towers from here? Don't you just love to sit beside the glass windows with those comfortable cushions looking out at the magnificent Twin Towers? SkyBar looks even better at night! I love the ambience here, especially with the beautiful Twin Towers in the background! Me and my friend ordered some nuts and a strawberry shake each. No alcoholic drinks for me as it was too freaking expensive and I needed to drive later! Oh well, maybe I will just drop by one of these days to have an alcoholic drink when I am in the mood for it! Haha! From where we were seated, I could have a bird's eye view of the park and waterfall below. 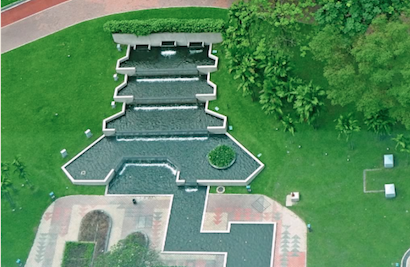 This waterfall is located at the park opposite the KL Convention Centre. I took a picture of one part of the waterfall earlier when I was near the park. 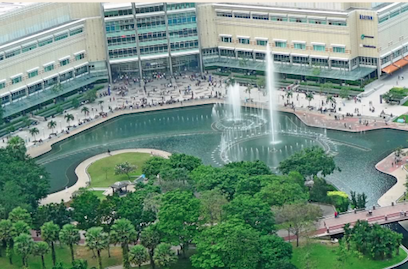 From up here, I could also see the fountain and lake outside Suria KLCC. 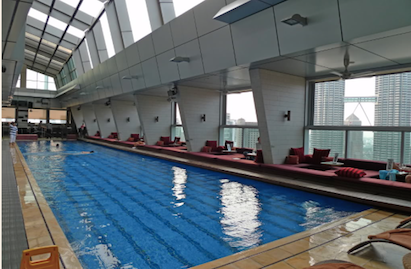 Oh, and the swimming pool too! I must bring a binocular next time to enjoy watching from afar! As the sun began to set, it was time to take some photos of the Twin Towers. And the KL Tower as well! 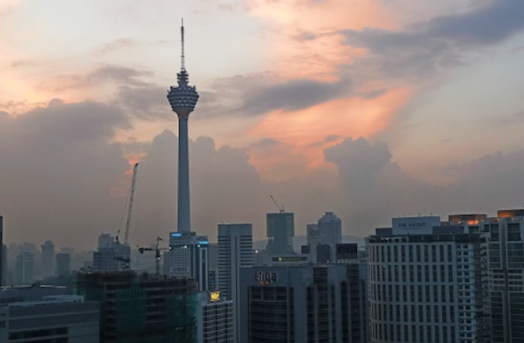 Or how about combining Twin Towers and KL Tower in one photo? We continued clicking away like nobody's business. I think those people who saw us must have thought we were tourists! Wow! This handphone shoots out flames! And it's directed at the Twin Towers! Haha! Have any of you went up there at that bridge connecting the two towers? 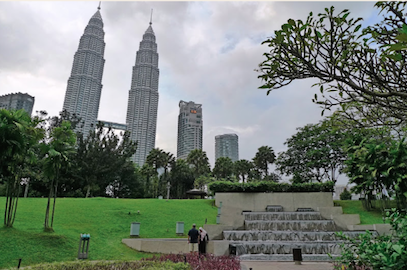 I just love the Twin Towers - it is my favourite building and I am so glad our former Prime Minister Tun Dr Mahathir had the foresight to build it! 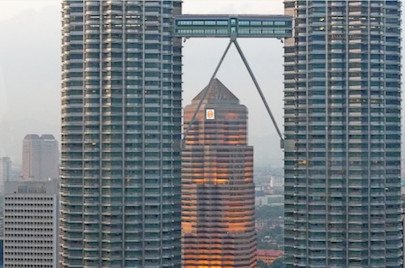 Imagine KL without the Twin Towers! OK, just in case this post is going to turn into a post on the Twin Towers, let me get back to the topic at hand here that is, SkyBar vs Luna Bar. 1. 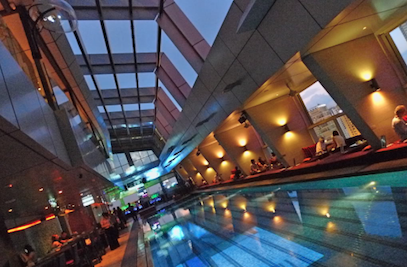 Both Luna Bar and SkyBar have very nice ambience. But SkyBar definitely trumps Luna Bar when it comes to the view outside the window! Probably that's the reason why I posted so many photos of the Twin Towers! Haha! Besides, you can only see ONE of the two towers at Luna Bar. 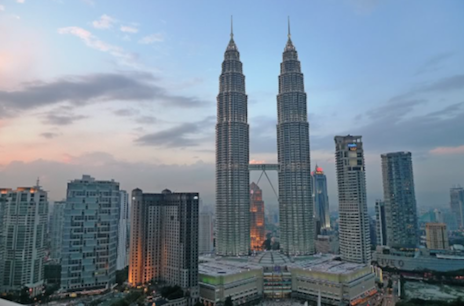 At SkyBar, the sight of both the towers are so magnificent it's hard not to be awed! 2. Although SkyBar has magnificent views, I can't help feeling a bit disappointed that they do not have an open roof-top bar like Luna Bar! In this regard, I think Luna Bar trumps SkyBar! 3. I think Skybar is probably more popular as it seems to fill up pretty fast compared to Luna Bar. Or is it because Luna Bar is bigger and can accommodate more people? Not sure about this, but one thing is for sure. Luna Bar has a RM50 cover charge on weekends after 9.30pm. That's not good! 4. I have problem finding Luna Bar in the Pacific Regency Hotel. It was complicating going up two different lifts and a series of staircases! Directing people to Luna Bar would be such a hassle! In contrast, going up to SkyBar was a breeze! 5. The service for both Luna Bar and SkyBar was generally OK. But I was appalled when the waitress at Luna Bar actually gave us the bill without us requesting for it and she also took away my drink before I gave her the permission to do so! How horrible! I could not really comment on the prices and quality of food and drinks as I did not eat or drink a lot at both of these bars. Although I must say the pizza at Luna Bar was really nice! My conclusion? Although different people may have different opinions, to me at least, I think SkyBar is the better of the two roof-top bars. What about you? All I can say is all the picture are so beautiful. What camera you are using? Lumix? BTW, i did a round tour with the GM on the hotel too.. Very nice views. Didn't notice how nice they are. Guess I was too caught up with the twin towers to pay attention to what's down below. Easy access is definitely a plus. I went up the connecting bridge couple of years ago. Worth a visit! 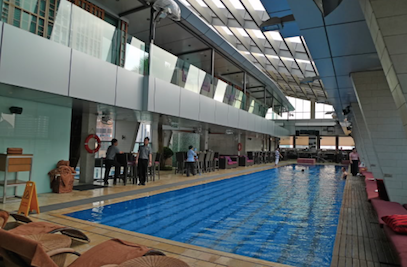 ooooh..i never been there before.. skybar or luna bar..looks very nice.. thanks for posting them up... malaysia boleh, huh! foong help! I lost my blogroll and when i relink u in my bloglist, it comes without the feed. means i cannot get updates of ur blog n it is always at the paling bottom of my list... wat happen? sob sob? help.. URGENT! wow, you went up there so early?? the sky is still bright..
at first i thot the pool is just merely a design, later only i realised it is actually a swimming pool for the hotel guests during day..
i remember the last time i went with colleagues was after dinner, around 10pm and guess that was the peak timing..
and we were given two tables by the window.. it was breezy that night, and quite foggy.. all of us being first time there, were so excited about the view..
but luckily i think it's quite normal, because i see lots of other guests also keep taking photos excitedly.. haha!! wow....nice pics of of the twin towers! Anyway, I find the dining tables shldn't be there near the pool. wow wow wow... i wanna go there... pls kidnap me and bring me along the next time you go there again ok?? 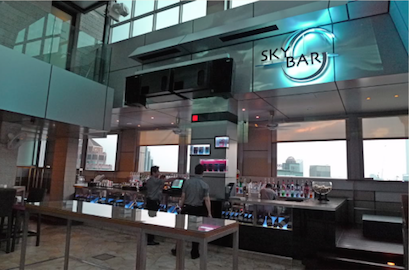 mmm..i think I'll bring my wife to Sky bar one day. Bad la you foongpc, put a hole in my pocket. reanaclaire, yes malaysia boleh! Haha! SK, haha yes go early can catch people swimming + get day and night views + make my money worth. Haha! So easy to fall into the pool meh? If fall, then smile and get your picture taken lah! LOL! khengsiong, oh yes! Their business will shoot above the roof top! Haha! Beautiful Twin Tower at night! 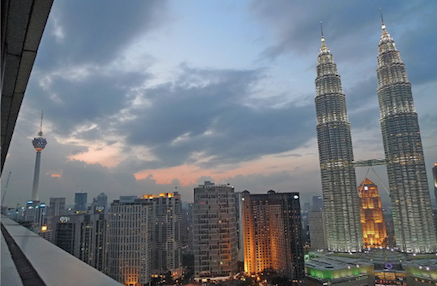 I can feel that you really enjoy in this nice ambience Skybar with the spectacular view of KL City! 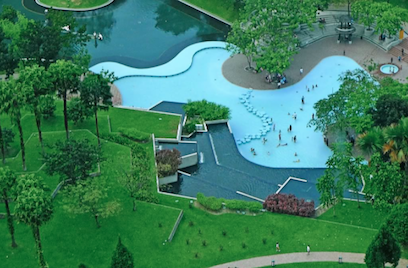 wow looks so different in the day.. and ppl actually swimming! yea the view is spendid! 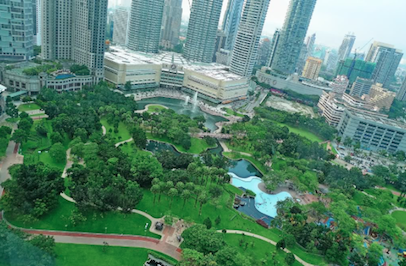 very nice esp wen u can see the KL and twin tower like tat..
Aside from the ambience of the place, service is equally as important, next would be convenience. I think having to take two elevators and then a series of staircases is such a turn off for me. So I would say, SkyBar is a better place. so sien.. still kenot rectify the 'feed' problem.. sigh.. I totally agree! Skybar 1 - Luna Bar 0! The view at Skybar is definitely breathtaking and I find the staff there are more polite! SKYbar FTW!!! your photos are great too! Been to SkyBar a few times. Always enjoy the atmosphere. To sit at the lounge couches along the side you need to make reservations yes. Perfect place to bring along foreign frieds. Drinks are - obviously - not cheap; you pay RM10 extra for the views :). 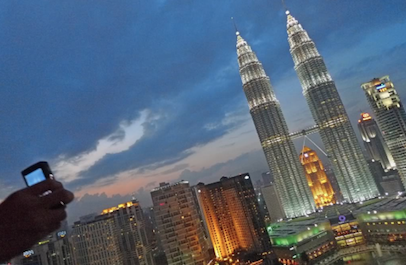 I will soon put our reviews of both SkyBars online on our travel website about Malaysia; Wonderful Malaysia. Best Collection Of English Songs (with lyrics). 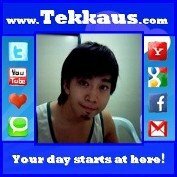 Do visit ourSongs. ourLyrics. ourMemories. To me, there’s 2 types of songs, good & bad. And I just like to stick with the good 1s. Excellent! this is such a neat idea. I'm joining and hoping to be a regular poster. I would like to thank you for the efforts you have made in writing this article. It comes to remain solid it's not about physical wellbeing but rather it incorporates psychological well-being as well. A man who is physically and rationally sound and nonappearance of any malady is called solid individual. In the modern time, there are many causes for thinning eyelashes, such as aging, poor makeup habits, product overuse, medical issues, etc. How can we get them back and reconditioned? Generic Latisse promotes long and thick eyelash growth while simultaneously conditioning them to allow for healthy new lashes. Latisse will help you find your eyelash beauty again. Whatever I can state is all the photo are so lovely. didn't see how pleasant they are. Figure I was excessively gotten up to speed with the twin towers to focus on what's down underneath.